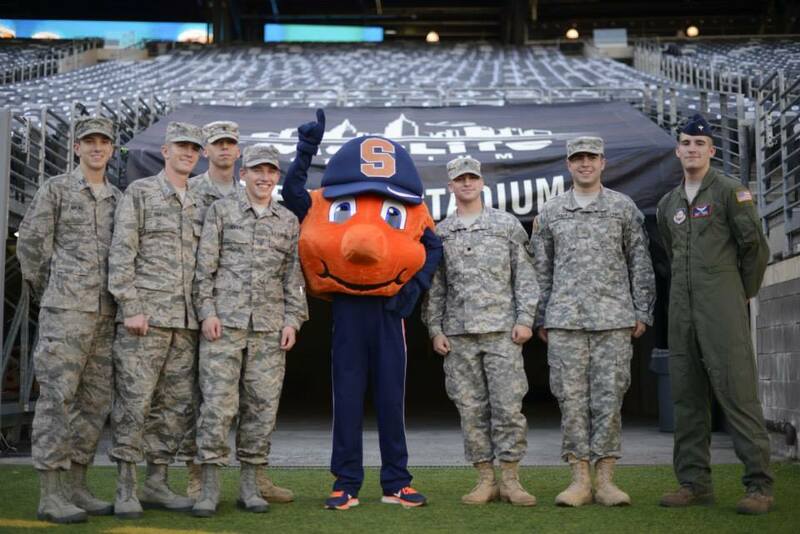 Syracuse University has been providing educational opportunities for military-connected students since 1918. We are grateful for your service and believe we know a thing or two about helping make your transition from duty station to campus as seamless as possible. Whether you are looking to take courses part-time, enroll in one of our traditional degree programs, or are being assigned to one of our military programs, you will find helpful information and contacts below and elsewhere on this website. Please let us know how we can serve you! AFROTC is a program designed to train cadets to be commissioned officers in the United States Air Force. Here at SU, we pride ourselves on having a meticulously designed training environment which gives meaning to the Air Force’s core values, fosters good camaraderie among cadets, and produces only the finest Air Force officers. Why Detachment 535? The choice is simple. No one can offer a wider selection of academic programs and paths to success than Syracuse University or one of our cross town schools below. Nestled in the hills of Central New York, Air Force ROTC at SU is the perfect way to set yourself up for success after graduation. The potential is for more than just a great career, but to do great things alongside even greater people. Army ROTC offers a commission as a second lieutenant in either the active Army or Reserve Forces in a variety of career fields including Combat Arms (Aviation, Armor, Artillery, Infantry, or Engineers), Combat Support, and Combat Service Support branches. There are two-, three-, and four-year scholarship programs available. Some cadets choose to join the National Guard or the Army Reserve while in Army ROTC, thus qualifying them for the Montgomery GI Bill benefits, in-state tuition (VANG) and other exciting benefits. Training with Army ROTC is a new experience every week. Training covers a wide range of skills that are needed to be an Officer in the Army. We do Situational Training Exercises to teach us and practice the different types of offensive operations and tactics used on the battlefield. Rapelling to teach us the proper use of knots and to build confidence in our abilities to rapel. Land Navagation to learn the ins and outs of map reading and navigating the land with just a map and a compass. Combat Water Survival Test to test our abilities in the water during stressful situations. Physical Fitness 3 days a week to make sure our bodies are in top shape to pass the Army Physical Fitness Test. Skiing/Snowboard once a year to give our battalion a little extra cohesivness. We also have a Military Ball and Dining In to bring everyone in the battalion together to have some fun and bond outside of training.